I was to be in Ireland that weekend for my grandfather’s birthday – and I’d expected to have to return the car on Friday night and then fly to Ireland the next day, but Tesla said the car could be returned Monday morning. With the help of Google Maps, I found it was possible to drive from Edinburgh to my grandfather’s place via the Stranraer-Belfast ferry on one charge. 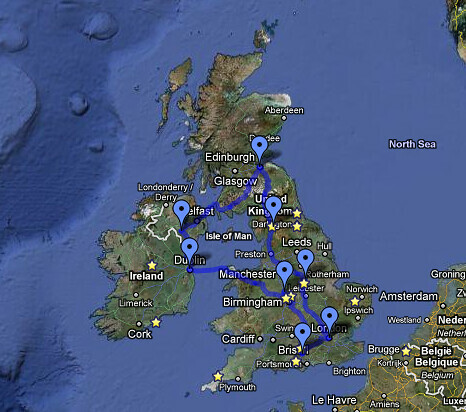 I would drive all the way back to London, via Northern Ireland, the Irish Republic, and Wales! Early Friday morning, the next leg of the adventure began. We cut across Dumfries and Galloway on the A702, a more direct route than the trunk roads most people take. To our delight, we discovered an empty, twisting Scottish mountain road of the sort beloved of sports car fans. Tempted by stunning scenery, changing gradients, and picturesque villages, I threw caution to the wind and drove the Roadster like it was designed to be driven. We stopped to take photographs by beautiful Clatteringshaws Loch. Around the next bend we discovered a hydroelectric dam nestled in the valley – we’d been taking pictures of a power station! There was a very good chance it had been supplying some of the renewable energy we used to charge the previous night. Arriving at the Stena Line Ferry, we informed the check-in staff that we had an EV and wanted to charge. EV charging on this route had been previously promoted, yet Stena had reversed its policy after a fire started by a home-made EV on another ferry in Scandinavia. A manager said that the new company policy would not allow charging on the ship, but he would try to get me plugged in dockside before we had to load. There were plenty of refrigerated trucks plugged into 32A three phase sockets, but I did not have an adapter. More for show than necessity, I plugged into a 13A socket next to the ship for 30 minutes. The ship’s crew came over to chat about the car and the previous fire. They agreed that an outright ban on charging was too harsh – and that professionally produced cars like the Roadster should be distinguished from conversions. During the crossing, the ship’s Navigator came to see me. He said he would love to get on-board charging reinstated as he expected to see many more EVs on the road and on his ferry. At this point, we learnt by email that our planned return ferry (operated by Irish Ferries) had a J1772 connector, again an adapter I didn’t have. The company was very apologetic for the late notice and said we would have been the first user. I started making some alternative charging arrangements. Thanks to Evan Tuer, a long time supporter of EVs from Scotland, we arranged charging in Dublin on Sunday morning. It was a three phase connector, however, so I’d need to get a plug for this outlet. We left the ferry and drove through Belfast to Armagh. Arriving at my uncle’s house, first priority was to find a working socket for the car. It was raining hard, which made my family and friends a little nervous; it was the first time they had seen an EV. The next morning we woke up and the car’s state of charge was over 75% full. Even the ubiquitous 13A socket can give usable range during an overnight stop. I offered my uncle £5 for the electricity, but he wouldn’t take it. We headed off to purchase the three phase plug for Dublin from City Electrical Factors – a chain that can be found all over the UK. We continued on to Dublin. Severe storms raged up the Irish Sea and we drove into gale force winds for most of the 85 miles. We got to the guest house in Dublin with a half a “tank;” we’d let the staff know we were coming and they had no problem accommodating the Roadster. To the delight of the owner’s teenage son, we pulled onto the drive and plugged right in. The next morning we drove to our charging location at the e-Cars department of the Irish Electricity Supply Board. To my relief, the three phase adapter that I’d made the previous day worked with no problems. As the Roadster charged, we talked about Ireland’s plans for infrastructure rollout, saw the first DC fast charger (yet to be installed) and had a look at the various Level 2 charging posts the team is evaluating. It’s almost certain that the next time we visit, Ireland will have blanket coverage of both CHAdeMO DC fast chargers and three phase Mennekes chargers. Mass market EV fast charging will be a reality for Ireland. We charged until the last possible minute before leaving to catch the ferry. 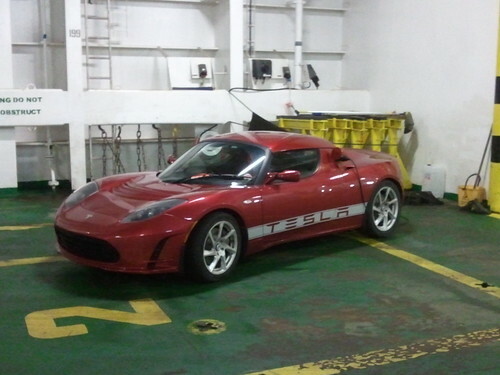 The ferry ride was an interesting experience: at first the crew was not aware they were equipped to charge an EV. Taking their best guess, they told us to pull up next to some sockets. I thought we were in luck – the sockets were more of the same 32A three phase outlets we’d just used at ESB. Using my adapter, I plugged in the Universal Mobile Connector. The charge port displayed a quick flash of lights, then nothing. The second outlet produced the same result. I tried a 13A socket, surely this one should have worked. Again, nothing. The ship ready to sail, we had to go upstairs before I could resolve it. Once underway, the helpful crew allowed me to go back to the car to try to resolve the issue. I estimated we were 10 miles short of our next charge stop. I had arranged a back-up stop on the Welsh coast, via the EV Network website. Eventually the ship’s electricians appeared with another adapter for the 13A charger and it burst into life. Relief! For about 10 minutes, I’d convinced myself we’d damaged the car from a badly-wired outlet. Off the ferry, we headed down through Wales on the A5, passing through Snowdonia and past the “Electric Mountain” hydro station. Wales must have seen very heavy rain that morning – the roads were like raging rivers. The Roadster took it in stride. 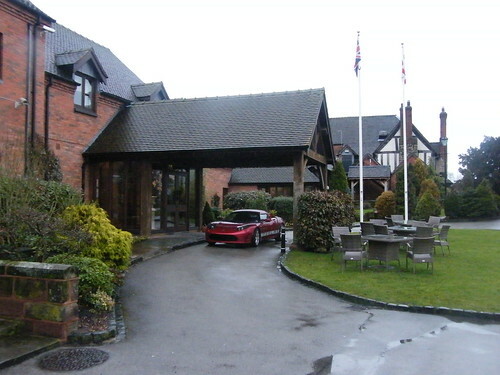 One hundred and thirty nine miles later, we arrived at The Moat House hotel near Stafford. We parked the Roadster, taking pride of place just outside the front door. The staff was delighted to see the car and helped us get connected to their 32A outlet. While the car recharged, we had a late lunch and nap, recharging ourselves for the last 151 miles back home. The Moat House is a really nice place to stop for a few hours while charging; excellent two rosette restaurant, comfy bar and plenty of quiet lounge space if you just want to relax or catch up on emails. It’s a great stop-off point on the M6 if you are driving between London and the North West or Dublin as we were. The remaining distance was well within the Roadster’s range, but to keep the charging stop short, we’d filled it with just enough juice to get home. It was another foggy night. Nearing London on the M40, we saw an overhead dot-matrix sign telling us our exit was closed. Why didn’t they say this before we got on the motorway? There was another route we could have taken had we known. Hastily checking the sat-nav for alternatives, we identified a back road. Lesson learnt – always ensure you have enough spare range to deal with detours. Nevertheless, we made it home. I plugged in to the 32A socket by the garage that I’d installed before my previous Roadster trip. Though long, the day brought many useful lessons of what to expect on an international road trip in an EV. 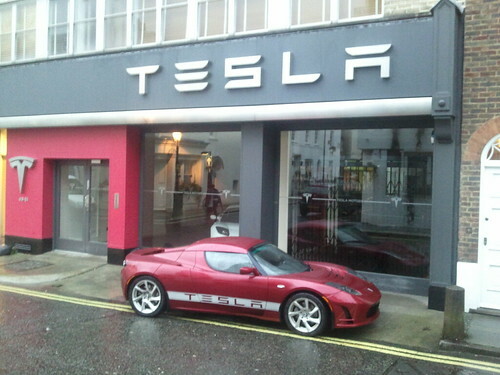 The next morning I joined the mêlée on the M3 to return the Roadster to Tesla London. 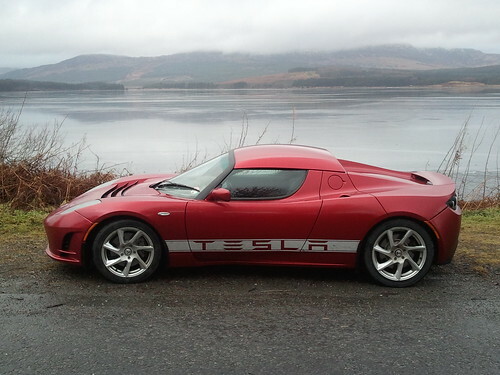 The weather was appalling, but after nearly 1200 miles, I knew nothing could faze the Roadster. Without fanfare, I put the keys through the letterbox and caught a train to work. We’d made a small piece of history, but gained an enormous amount of knowledge. Overall, we found people from both inside and outside the EV community willing to pull out the stops to make such a trip work. We found that once people see the car and understand that it can be plugged into a familiar outlet, they go out of their way to help. I find this is particularly true with electricians – they see the familiar 32 Amp plug and any sense of mystery instantly vanishes and they want to know everything about the car. I’d like to say a big thanks to all who made this trip possible. Since the trip, there has been discussion in the community as to the purpose of EV road trips and their place in the media spotlight. What’s clear is that right now EVs are ideal for the daily driving needs of most people. The media, not just the BBC, can support the budding industry by focusing on the merits and the day-to-day experiences of those who own EVs today. As an EV enthusiast, and like many other Roadster drivers, I like taking EV road trips to gain knowledge and experience, and to raise awareness of an EV’s merits amongst the people whose paths I cross. We’ve a long way to go to ubiquitous fast charging locations. But, road trips like mine are great fun and are clearly possible with good planning and a little help from your friends.